Ours is no caravan of despair. There was a monastery that had fallen upon hard times. Once a great order, all its branch houses were lost and there were only five monks: the abbot and four others, all over seventy. Clearly it was a dying order. In the deep woods surrounding the monastery there was a little hut that a rabbi from a nearby town occasionally used for a hermitage. Through their many years of prayer and contemplation the old monks had become a bit psychic, so they could always sense when the rabbi was in his hermitage. “The rabbi is in the woods, the rabbi is in the woods again” they would whisper to each other. As he agonized over the imminent death of his order, it occurred to the abbot to visit the hermitage and ask the rabbi if by some possible chance he could offer any advice that might save the monastery. In the days and weeks and months that followed, the old monks pondered this and wondered whether there was any possible significance to the rabbi’s words. The Messiah is one of us? Could he possibly have meant one of us monks here at the monastery? If that’s the case, which one? Do you suppose he meant the abbot? Yes, if he meant anyone, he probably meant Father Abbot. He has been our leader for more than a generation. On the other hand, he might have meant Brother Thomas. Certainly Brother Thomas is a holy man. Everyone knows that Thomas is a man of light. Certainly he could not have meant Brother Elred! Elred gets crotchety at times. But come to think of it, even though he is a thorn in people’s sides, when you look back on it, Elred is virtually always right. Often very right. Maybe the rabbi did mean Brother Elred. But surely not Brother Phillip. Phillip is so passive, a real nobody. But then, almost mysteriously, he has a gift for somehow always being there when you need him. He just magically appears by your side. Maybe Phillip is the Messiah. Of course the rabbi didn’t mean me. He couldn’t possibly have meant me. I’m just an ordinary person. Yet supposing he did? Suppose I am the Messiah? O God, not me. I couldn’t be that much for You, could I? As they contemplated in this manner, the old monks began to treat each other with extraordinary respect on the off chance that one among them might be the Messiah. And on the off off chance that each monk himself might be the Messiah, they began to treat themselves with extraordinary respect. Because the forest in which it was situated was beautiful, it so happened that people still occasionally came to visit the monastery to picnic on its tiny lawn, to wander along some of its paths, even now and then to go into the dilapidated chapel to meditate. As they did so, without even being conscious of it, they sensed the aura of extraordinary respect that now began to surround the five old monks and seemed to radiate out from them and permeate the atmosphere of the place. There was something strangely attractive, even compelling, about it. Hardly knowing why, they began to come back to the monastery more frequently to picnic, to play, to pray. They began to bring their friends to show them this special place. And their friends brought their friends. Then it happened that some of the younger men who came to visit the monastery started to talk more and more with the old monks. After a while one asked if he could join them. Then another. And another. So within a few years the monastery had once again become a thriving order and, thanks to the rabbi’s gift, a vibrant center of light and spirituality in the realm. For the gifts which we have received — and the gifts which we, ourselves, are — may we be truly grateful. Yet more than that, may we be committed to using these gifts to make a difference in the world: to increase love and justice; to decrease hatred and oppression; to expand beloved community; to share, and to keep sharing, as long as ever we can. Amen. [F]rustrated citizens have tried to fill the vacuum. Like-minded “followers” and “friends” feed us news online; people sometimes barter on eBay rather than bow to big corporations; and parents increasingly homeschool their children rather than expose them to failing public schools and unsafe streets. But this is coping, not institutional adaptation. And sociologists say we need the control that institutions provide: It’s how things get done. When people trust their institutions, they’re better able to solve common problems. Research shows that school principals are much more likely to turn around struggling schools in places where people have a history of working together and getting involved in their children’s education. Communities bonded by friendships formed at church are more likely to vote, volunteer, and perform everyday good deeds like helping someone find a job. And governments find it easier to persuade the public to make sacrifices for the common good when people trust that their political leaders have the community’s best interests at heart. “Institutions — even dysfunctional ones — are why we don’t run amok in the woods,” Hansen says. Still, no metrics exist to measure life without institutions, because they’ve been around as long as humankind. The first institution was the first family. The tribe was the first community. The first tribe’s leader was the first politician, and its elders were the first legislature. Its guards, the first police force. Its storyteller, a teacher. Humans are coded to create communities, and communities beget institutions. What if, in the future, they don’t? People could disconnect, refocus inward, and turn away from their social contract. Already, many are losing trust. If society can’t promise benefits for joining it, its members may no longer feel bound to follow its rules. But is the rise of disillusionment inexorable? Can institutions regain their mojo? History offers hope, but Whitmire’s story, and the story of Muncie, say no. My first reaction was a kind of disbelief. Such an odd statement, made, in fact, by an Obama supporter. But surely that’s not right; how could he say that? And then the truth sank in. Of course he was right. If no one believed Obama was President, then he could not act as President. He would not, in fact, be President. The very existence of the office of President depends on our believing in it; believing that it entails certain duties, responsibilities, privileges defined by the Constitution, legal traditions, and customs of the past 227 years; believing that the person occupying that position has a legitimate claim to occupy it. In short, it’s a matter of faith, not natural law. And 2006 wasn’t a high point: average confidence had been 43% in 2004. And, of course, faith in opinion surveys has fallen considerably since November 2016, so, maybe these observations don’t mean anything. But I think they do. I think we, all of us, our neighbors, our kinfolk, the people in other states, see the world through much darker lenses than we used to. Or, perhaps, darker than we thought we used to. Of course, there has always been some lack of confidence in institutions in the United States; there have always been elements in the population who saw through darker lenses. There will always be some people who are poorly served by some institution; institutions, after all, are just people working together, and people don’t always get things right. In the 1950s, Pete Seeger sang “the banks are made of marble, with a guard at every door”, protesting the banks’ economic exploitation of workers, while the John Birch Society and the House Un-American Activities Committee sought to weed out such “unAmerican” characters as Pete Seeger. Not much trust there. But assuming that there was a time when trust was high and most people had rosy lenses, what happened? Earlier this month Leonid Bershidsky, writing in BloombergView, contrasted the level of trust in Western democracies and in the Soviet Union and its satellites. He went on to note that this lack of trust has continued after the fall of Communism. And this is understandable. Rebuilding trust is very difficult. Western democracies have historically been places with higher levels of trust. But this has changed in recent years. In the United States, there’s “less trust in some key institutions than in Russia, one of the world’s most distrustful societies.” [Bershidsky] But the lack of trust is mixed, not uniform across the population. Unlike the former Soviet block countries, there’s a “trust gap” between two parts of the population, between the “informed public” and the “mass population.” College-educated Americans have far more confidence in our institutions than does the rest of the population, a disparity that could illuminate, if not explain, the events of the 2016 Presidential campaigns and election. Okay, but how did that happen? Well, that’s one story, but maybe not the full story. It doesn’t quite explain the disparity between the college-educated and the “masses”, nor the fact that this growing lack of trust affects Western Europe as well as the United States. I’m a product of a small, rural community built around agriculture and small industry. It was a community where at least some people never locked their doors; where children were cared for, and about, by their neighbors as well as by their parents; where neighbors helped neighbors when there was need – “neighborly”, I learned, was a verb among the farm families. I know this spirit still lives there because of the way the community responded to a devastating tornado in April 2015. I believe that I am not alone in carrying this background – I thought it was normal. It’s hard for me to accept this loss of faith. So, no matter how we got here, what does all this mean? Bershidsky pointed out that “low-trust countries often readily submit to strong-handed rule”. And what now might happen? Bershidsky offered three possible outcomes. But even if the course we’re on is not toward totalitarianism, the loss of trust is troubling. It has been demonstrated that societies with greater levels of trust tend to enjoy better economic conditions. And, perhaps more importantly, they are more comfortable places for people to live. If you can trust the people around you, you, and they, will live better. Last week, Anthony Makar of the Unitarian Universalist Congregation of Atlanta, in a sermon aptly titled “Now What?”, and posted to his blog “Soul Seeds”, presented a path for us to proceed, individually and collectively. He calls on us to abandon both optimism and pessimism, and proceed in a spirit of hope, by considering The Love and Justice Pledge. The Love and Justice Pledge is about using our Unitarian Universalist power toward the ends of healing, resistance, and positive change. It staunchly affirms freedom, truth over propaganda, science in the service of humanity, diversity, and liberalism of heart and mind. It is fundamentally an expression of hopefulness and a rejection of despair. It is an expression of divine love’s restlessness. 6. AFFIRM SUSTAINABILITY: I will strive to balance work for peace and justice with enjoyment of the things in life that are good and beautiful. I, ______, pledge to do these six things as my way of contributing to the ongoing work of love and justice in 2017. This is my art, this the game I never cease to play. I turn the wheel that spins. I delight to see the high come down and the low ascend. Mount up, if thou wilt, but only on condition that thou wilt not think it a hardship to come down when the rules of my game require it. Thou hast resigned thyself to the sway of Fortune; thou must submit to thy mistress’s caprices. What! 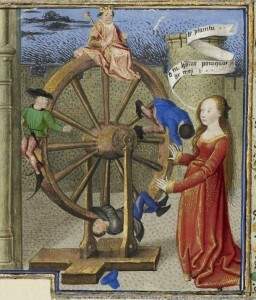 art thou verily striving to stay the swing of the revolving wheel? Oh, stupidest of mortals, if it takes to standing still, it ceases to be the wheel of Fortune. Cherish your doubts, for doubt is the servant of truth. Question your convictions, for beliefs too tightly held strangle the mind and its natural wisdom. Suspect all certitudes, for the world whirls on — nothing abides. Yet in our inner rooms full of doubt, inquiry and suspicion, let a corner be reserved for trust. For without trust there is no space for communities to gather or for friendships to be forged. Indeed, this is the small corner where we connect — and reconnect — with each other. The chalice has been extinguished. Announcements, Comments, Shameless Self-Promotions, Etc.